Sinewy lines and subtle contours abound in organic bathroom fixtures—plus, three engineered materials that are increasingly indistinguishable from their natural counterparts. 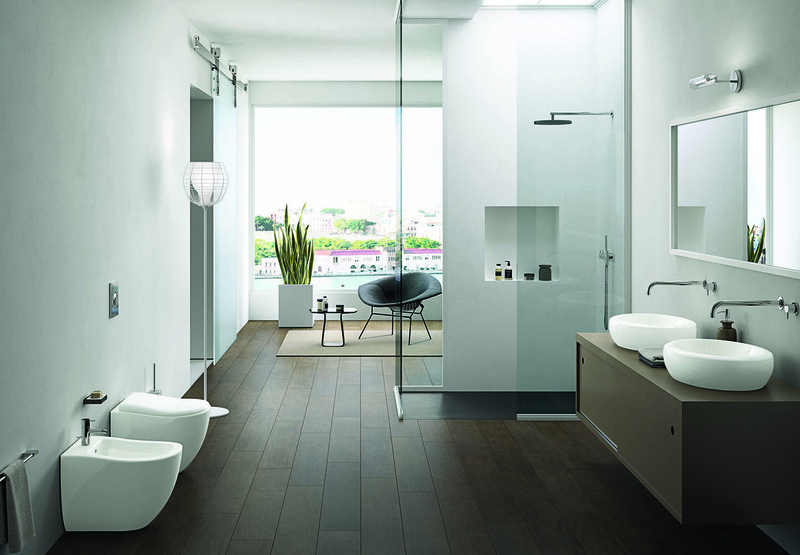 Fluid Collection by Marco Piva for Cielo Fluid’s curvaceous pieces live up to the moniker with a line of ceramic freestanding, wall-hung, and sink-top wash- basins, as well as traditional and wall-mounted toilets and bidets. Tombolo Bath Caddy by Victoria + Albert Baths Keep bath essentials within arm’s reach with this undulating bath caddy made from walnut or light oak laminate. Made from injection-molded BluStone - a durable quartzite that's nonporous, anti-microbial, and stain- and scratch-resistant - the tub is available in a glossy or matte finish. Starck Organic Faucet by Philippe Starck for Axor by Hansgrohe Chrome is given a softer look in this streamlined fixture, which integrates handles into the faucet body. 815 Washbasin by Benedini Associati for Agape Design The asymmetrical form of Agape’s Cararra marble sink is modeled after the effect of water eroding stone. Silestone Quartzite by Cosentino Based in Spain, Cosentino produces the granitelike Ocean series of Silestone quartzite surfaces, shown here in Pacific. Volcano Porcelain Tile by Nemo Tile Nemo Tile’s Volcano line of porcelain tile is a dead ringer for natural stone. Volcanic rock found in southern Italy inspired the seven available colorways like Grigio, shown above. AnTeak by Walker Zanger AnTeak, by Walker Zanger, is made of FSC-certified reclaimed wood. It comes in seven patterns, from herring-bone (above) to penny tile.